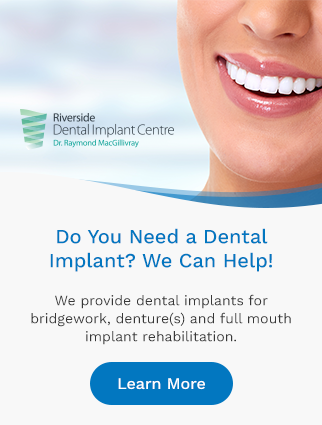 Meet Dr. Chris MacDonald and Dr. Raymond MacGillivray, your dentists at Riverside Dental in Sydney River. Dr.MacDonald was born and raised in Sydney Mines, NS. He graduated from Memorial High School in 1988. In 1995, he graduated from the University of New Brunswick and then went on to Dalhousie University and received his Doctor of Dental Surgery Degree in 1999. Dr. MacDonald was offered an Associate position with Mayflower Dental following graduation from Dental School. He was an Associate for one year and became a Partner with Mayflower Dental. He is currently practicing at Mayflower Dental Group’s newest location, Riverside Dental in Sydney River, NS. Dr. MacDonald has a growing practice and enjoys all aspects of Dentistry, particularly Cosmetic Dentistry. Crowns, bridges, veneers and implant restorations are very rewarding for him. He has a great repore with his patients and creating healthy smiles is his number one priority. Outside of the office, Dr. MacDonald enjoys spending time with his family and friends. He enjoys travelling and is an avid golfer and hockey player. Raymond MacGillivray grew up in Victoria Mines Cape Breton, attending school in New Waterford and graduating from Breton Education Centre in 1980. He received a Bachelor of Science degree from St. Mary’s University in 1983 and a Doctor of Dental Surgery from Dalhousie University in 1987. Dr. MacGillivray joined the Canadian Armed Forces in 1984 and served in the Dental Corp as a General Dentist from 1987-1991. He attended the University of Miami/Jackson Memorial Hospital from 1991-1995 receiving his Certificate in Oral Maxillofacial Surgery. He continued his career in the military at CFB Stadacona in Halifax until 2000 when Major MacGillivray took his release and entered private practice. Dr. MacGillivray has maintained a private practice in Dartmouth since 2000. He is now returning home to live in Victoria Mines and continue the practice of Oral Maxillofacial Surgery at Riverside Dental in Sydney River. Oral Surgery services include routine extractions, surgical extractions, wisdom teeth removal, bone grafting of the jaws and sinuses to support implant treatment, implant surgery, exposure of impacted teeth to facilitate orthodontic treatment, soft tissue grafts, surgical endodontics and the treatment of oral pathology and infection. Intravenous sedation is available for all surgical services. Dr. MacGillivray will be happy to assist your Family Dentist in providing you with the best possible dental care. Dr. Thayne Bezanson is originally from Cole Harbour, NS. He completed his BSc in Biology, graduating from Dalhousie in 2008. He then completed his Doctor of Dental Surgery, graduating from Dalhousie in 2014. Upon graduating, Dr. Bezanson relocated to Newfoundland where he practiced in Grand Falls for 3 years. He has extensive immediate family from Cape Breton and spent many summers growing up in Sydney. He is happy to be home. Dr. Bezanson is interested in all areas of dentistry, including implants, crowns, root canals as well as emergency care. His personality and easy smile will help you relax from the moment you walk in. Outside of the office, Dr. Bezanson enjoys sports (especially hockey), travelling and hiking. He and his lovely bride Jessica were recently married on the Isle of Skye in Scotland.